This is the ninth of a series of weekly posts that covers my efforts to learn and create with Smith-Micro's Poser application. I'll share the information I learn, any tricks or tips I come across, and my thoughts on Poser as a creative tool. My goal will be to follow my interests as I become more familiar with the program. 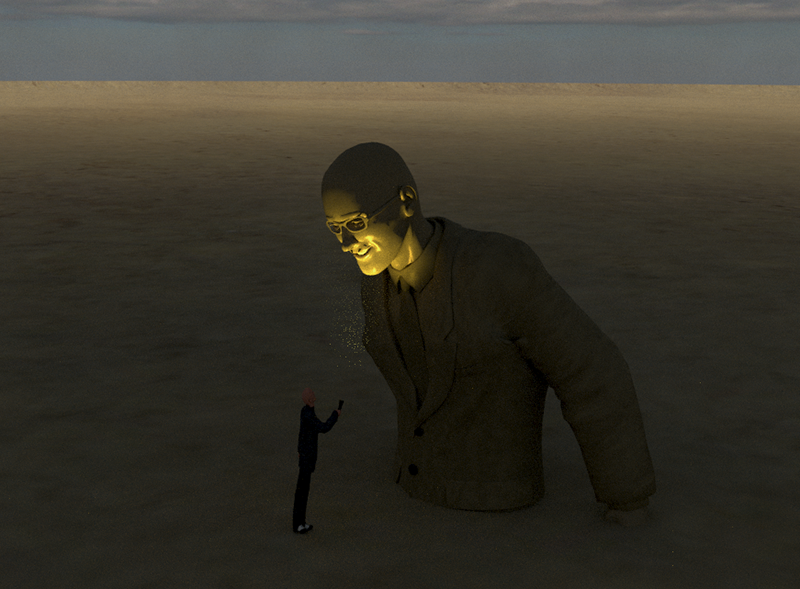 This weeks entry is a continuation of my work creating a surreal scene in Poser. Last week we created the figures, posed them and experimented with various cartoon styles of rendering. Before we begin I want to clarify that I am using Poser Pro 11.1. Smith-Micro created two versions of Poser: Poser 11 and Poser Pro 11. The difference is that Poser Pro provides advanced rendering, a fitting room for clothes and more. The price for Poser Pro 11.1 is $349. Upgrade from Poser 11 is $110. 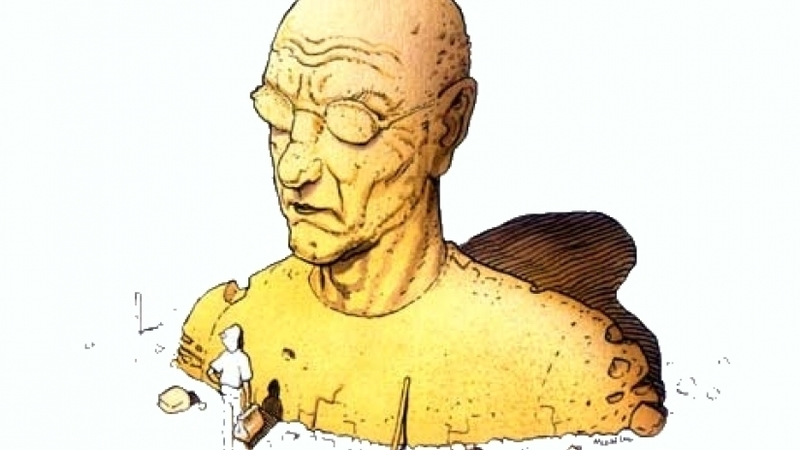 Last week I worked on a Moebius inspired scene where a character encounters a much larger version of themselves buried in the sand. We worked a lot with posing the figures and working out the various materials for both figures and the environment. We then played with various ways to render the scene using cartoon-style rendering (which Poser does very well). Then a curious thing happened as I was continuing to work on the scene - it started to change and my imagination kicked in. I started to think of the scene as something more ominous and dark. Instead of the brightly lit almost comic Moebius scene, I began to respond to the characters and think of them as in conflict with each other. In fact, I accidentally moved the larger figure and changed its pose and this gave me the idea that it was threatening the smaller one. Instead of the suitcase (see Moebius scene above), I wanted to add a flashlight. After searching in Google I found a free .obj format model of a flashlight and imported it into the scene. Yikes! The object is huge. Somehow the scale was off, but it's not a big problem to scale it down. The Renderosity Poser forum was a big help here as I wasn't sure how to parent the flashlight to the hand of the small figure. Just select the object, right-click and go to parenting. Choose the hand and you are set. Now the flashlight will move when you pose the hand. I learned that there is a neat little hand morph “grasp” that allows you to position the fingers perfectly with whatever prop you are using with the hand. In my scene, because the camera will be wide, we don't need to worry too much about it. After posing the two figures I turned to lighting. I wanted to reduce the wider lighting in the scene and focus on creating a flashlight beam shining up into the smiling face of the large character. This turned out to be harder than I thought it would be. Initially, it was easy to remove all lights then create a simple spotlight for the flashlight beam. By adjusting the color and the properties of the light I created just the right ominous mood for the scene. The challenging part came when I tried to create a beam of light from the flashlight to the large character's face. For some reason, there is no native way of creating a light beam in Poser. A Renderosity Poser forum members suggested using a cone object and adjusting the translucency. I didn't really want to do a workaround like that so it occurred to me to try creating a fog or smoke around the figures. That way the light beam would show up in the fog particles and the scene would be even moodier. I still wasn't satisfied so I removed the sandy ground/skydome and replaced them with a photo studio neutral background. I threw some light on the background and made it a bit blurry then started in on the volumetrics again. I chose the smoky room for the type of volumetrics as this was the one chosen in the tutorial. Initial renders were spotty so I cranked up the atmosphere intensity on the main light and it started looking better. Eventually, I hit on something that was close to what I imagined. The scene had an ominous quality while still retaining the surrealist vibe. You can see the final result in the splash picture at the top of this page. Note that I discovered some strange marks around the lips of my giant character which I had to remove in photoshop. Something wrong with the smile morphs and the rest of the face, I imagine. One thing to note that if you use volumetrics your Poser render-time is going to be much longer than regular renders. My final render (only medium-gpu) took 20 minutes whereas most of my other renders have taken 5-10 mins max and have a beefy graphics card. Next week: Let's try some animation!